The months under spring and autumn’s sway are very turbulent in their weather. We have beautiful sunny days mixed in with storms and snow. The clouds are charcoal black and move in swiftly on high winds. They replenish the land with moisture and then move swiftly on. 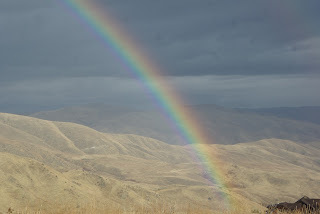 What I love about spring and autumn in the mountains are the rainbows. Because many of the storms rise up in the afternoon, and are over quickly, the sun has a chance to break through, low, over the horizon. The sun extends its beams like fingers through the water in the air and the water creates prisms that divide the white light into brilliant colors. If it’s dark on one side of the sky and the sun is shining through on the other, the combination is magical: a rainbow appears, sometimes two, and arcs over the glens near my house. The colors can be sometimes muted if the sun is very low, or sometimes can be so bright that it takes your breath away. Sometimes you see two rainbows: one of startling color and one shadowing it, less intense, but ever real in its impact. Look at the conditions that bring such beauty: high winds with sharp icy rain that pounds the mountainsides or fast moving storms where the rain races parallel to the ground. Out of such ferocity comes such beauty that it’s easy to forget what brought that rainbow about. declares the Lord. ‘As the heavens are higher than the earth, so are my ways higher than your ways and my thoughts than your thoughts. As the rain and the snow come down from heaven, and do not return to it without watering the earth and making it bud and flourish, so that it yields seed for the sower and bread for the eater, so is my word that goes out from my mouth: It will not return to me empty, but will accomplish what I desire and achieve the purpose for which I sent it. God uses His creation to reveal central truths about Himself and about His relationship to us. Are we listening to the rainbow’s message of His fierce love for us and well as His love of justice, or is the rainbow just a passing glimpse of color? Precious God: You remind us all of the time in Your mighty creation of Who You are and the love You hold for us. You are majestic and yet bend down and touch our tearful faces. Let us not forget that we are accountable for our lives and while You extend mercy for a long while, Your justice is equally important, and will have its day. In Your Son’s Name, amen.